Caesar salad is something that non-vegans will swear vegans can’t re-create! Ah-ha… you’re wrong. In fact, a vegan kale caesar salad is SO much healthier for you, you’ll want to eat this version from now on. It will leave you feeling light, clean, and energized. Feel free to use romaine lettuce instead of kale for an even more traditional salad. And I prefer the taste of roasted garlic in a caesar dressing because it makes it sweeter and less over powering. You know, I just like to switch it up wherever I can! You can even take your vegan caesar salad game to the next level and wrap it up to eat on the go! This kale caesar salad is better than any traditional version around! To prepare the bulb of garlic for roasting, peel the outer layers of the garlic bulb leaving a thin layer still in tact and cut the top of the bulb off (approximately 1/4-inch from the top) so the cloves are visible. Coat the top with 1 tbsp of olive oil and a pinch of sea salt, then bake for about 35 minutes or until the cloves are browned and soft to touch. Remove the roasted cloves of garlic from the bulb and place in a high-powered blender. Drain the soaked cashews and rinse with more water until it runs clear. Place the cashews and the remaining dressing ingredients in the blender and mix on high until very smooth. Refrigerate the caesar dressing for at least 1 hour before serving. In the meantime, prepare the croutons and tempeh bacon. Start by preheating oven to 350°F. For the croutons, whisk together olive oil, garlic powder, onion powder, sea salt, and ground black pepper. Toss the cubed bread in the mixture until well coated. If you're adding the vegan parmesan, add that to the bowl and toss to coat the bread evenly. Lay out the bread onto a baking sheet and bake for approximately 10 to 15 minutes, turning over once in the middle of baking, until golden brown. Depending on the bread you use, the time will vary so just keep an eye on them. Gluten free bread takes longer, approximately 20 minutes and gluten free bread is always a bit gummy so don't expect them to be crispy crunchy croutons. I prefer an Italian baguette! 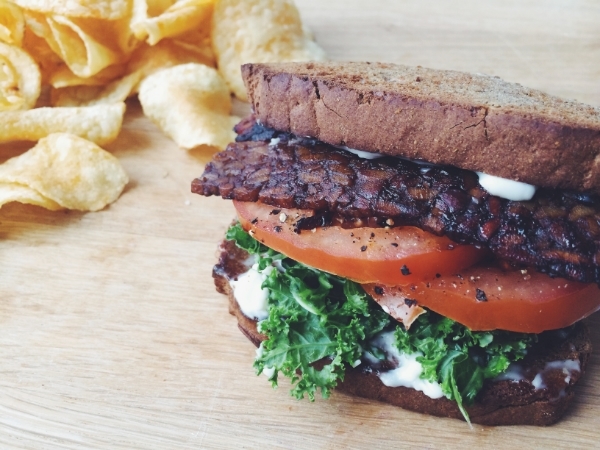 For the tempeh bacon, thinly slice the tempeh into strips approximately 1/8-inch to-1/4-inch thick. Whisk together low-sodium soy sauce or tamari, water, liquid smoke, maple syrup, and smoked paprika in a shallow dish that you can use to marinate the tempeh in. Lay the slices of tempeh in the dish and refrigerate for at least 1 hour. To cook, heat a non-stick pan over medium and add 1 tbsp of coconut oil. Once the pan is hot add the slices of tempeh without overcrowding the pan. You might need to cook in two batches. Once the first side starts to brown, you'll want to start de-glazing the pan with a bit of the left over marinade to prevent the slices from sticking and to get them really caramelized and browned. Flip the slices and do the same thing on the other side. You may need to add another tablespoon of coconut oil at this point. Cook time is approximately 15 to 20 minutes. Remove from the heat to cool while you assemble the caesar salad. Wash kale and remove the leaves from the stems and discard those. Finely chop the leaves into ribbons or shreds and place in a large mixing bowl. Put lemon juice and sea salt on the kale and massage it into the leaves lightly with your hands for 2 to 3 minutes until you notice it becoming darker in color and slightly wilting. Add 1 cup of the caesar dressing and ground black pepper and toss to coat evenly. Portion out the dressed kale to your serving dishes and top each salad with tempeh bacon, garlic croutons, and drizzle more dressing, as desired. Serve immediately. Tempeh bacon makes this more of an entree salad, but you could also use coconut bacon for an appetizer version. This looks so good. I am going to try the dressing for sure!! This looks AWESOME! I LOVE your photo pouring the dressing!!! How long would the dressing keep for? thanks so much! It’s one of our faves and tends to blow non-vegans away 🙂 Enjoy! I just made this and it’s sooo good!!! Can you make a vegan lobster bisque??? Do you think it’s possible for me to use cashew butter in a normal blender because I do not have a high speed blender? I used raw cashew butter just because the whole foods I went to was out of raw cashews. It worked great because I didn’t have to soak them or anything i just threw it in the blender with everything else, although I do have a vitamix. But it was delicious I’m pretty sure it’s extremely similar to using the whole cashews! Made this tempeh bacon the other night, it was delicious! I put it on sandwiches though so next time Ill have to try to salad too! Love what you guys do here! Lovely recipe! I was just wondering if there can be any replacement for the cashews? This was AMAZING! I substituted tofu for cashews (because it is cheaper, less calories, and doesn’t require overnight prep), and it came out jUST AS CREAMY and SOOOO DELICIOUS! Everyone in the world has got to try this!! Does the kind of tofu I use (firm, extra-firm, silken, etc.) matter or can I just use any? HELP please! well it will matter to the thickness of the dressing. I used firm though, since that’s what the tofu feta was made out of! Love your recipes, but this was a miss for me! I followed the recipe, even had a little bit extra tempeh, even when I questioned the measurements at the time, and this was way too smokey! Inedible in fact. So sad that I wasted 1/3 of a cup of my liquid smoke on this 🙁 I couldn’t eat it and my whole house and fridge smelt of smoke. I will try it again but will probably reduce the amount to about the same as your other bacon seasoning recipes (cassava & coconut). Maybe it was just me, but I thinking about it 1/3 of cup sounds like an awful lot. I will say 1/3 C now looking at the recipe does seem a little weird. Mind you i’ve made this so many times and usually just improvise my "bacon" marinade now, but I don’t even think I add that much?! this is an old recipe and perhaps it was a typo. I’m so sorry you had to waste the tempeh! I will review and revise. I keep founding myself watching your channel (all day , whenever I have free time)and following your recipes(log onto your website so many times in a day lol ) !